Spectra Energy is proceeding with their illegally segmented “Algonquin” Pipeline expansion project that stretches from Stony Point, NY passing Indian Point Nuclear Power Plant and through Massachusetts and beyond for Canadian export of fracked gas. Is Governor Cuomo a fracking hypocrite? Right now, as you read this, there’s an incredibly dangerous transition happening in the United States. And it has nothing to do with Donald Trump. Well, it didn’t start with him at least. In a disastrous move for the climate, instead of transitioning directly from coal-fired power plants as the main source of energy generation to 100% renewable energy, the United State is building a fracked gas ‘bridge’. This ‘bridge’ requires millions of fracked wells and building thousands of miles of pipelines and some 300+ fracked gas power plants. NY Offshore Wind: 60 second Film to share + NYC Official Info Sessions + Sane Energy's beautiful graphic presentation on Wind: Who, what, where, when & why. Sane Energy Project gathered allies in the WinWindNY coalition to make a 60-second Public Service Announcement about Offshore Wind for New York to help educate our communities that wind is here, and if we work together, we can make the renewable economy include our community values. Click > HERE < to watch and share this fun video. Rockaway Beach info HERE with a pre-rally and press conference to kickoff the three days of wind! Almost two years ago, all of us working together defeated the possibility of liquefied natural/fracked gas (Port Ambrose L.N.G.) off our New York City/Long Island shores in a spot slated for energy development. Sane Energy Project ran on a platform of WIND NOT LNG, and together, we WON! Now we are working hard to make sure that the renewable generation that is coming onto our grid is developed responsibility with ethics before profit. We know a way to assure this, is by working with a strong coalition of communities and organizations to work toward "Community Benefit Agreements" in any contract that is signed between New York State and the wind developer. Here's the scoop on offshore wind for New York State scroll down to view or click > HERE < to view and download our presentation. The team at Sane Energy Project was not shocked to receive the news of the withdrawal of the USA from the Paris Climate Accord. The behavior of the Trump administration follows a pattern in which the fortunes of a few in power are valued more than the health, safety and long-term economic health of the rest of us. Following the announcement, our nation responded: numbers of governors, mayors, academics, and businesses vowed to abide by the the Paris Climate Accord and stand with the almost 200 nations that signed onto it, committing to reduce greenhouse gas emissions, foster adaptation and mitigate climate impacts. We are pleased Governor Cuomo and Mayor De Blasio’s decision to adhere to the accord and to make New York State and New York City a powerful example and a beacon of hope for the rest of the country. Now is our time to hold them to this decision. Scroll down for five action steps. For our part, Sane Energy Project vows to continue our work at the state and local level, recognizing that our choices here resonate with those who are suffering the brunt of climate impacts around the world. We will push to correct the cognitive dissonance of policy makers who talk about lowering emissions while promoting the use of fossil and nuclear fuels. We will continue opposing the development of fracked gas and oil infrastructure, and we will push for a rapid conversion to equitable, renewable energy, especially offshore wind, through policy initiatives, education and direct action. We will continue to fight for a place at the table for citizens to have a say in energy decisions that affect our lives and livelihoods. We will continue to build a world that values the health and safety for all we share this small planet with. Love, Kim, Monica and the team at Sane Energy Project. 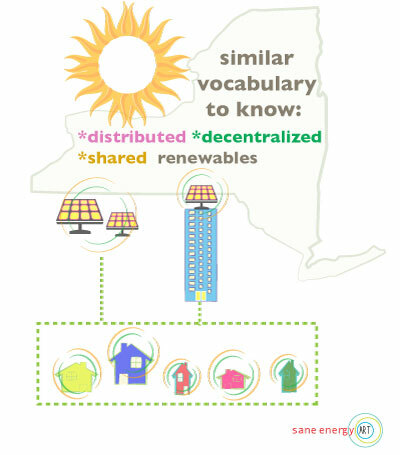 As New York grapples with the future of *distributed energy, especially solar, the state is at a major crossroads that could decide whether it embraces a clean and equitable future, or if it sets the table for only the large players to sit. A recent solar conference in Brooklyn, solidified my thinking on which direction the state is choosing – letting the big guys run the show. The panel in the morning session on NY State project issues featured only big players. Not a single small player made it. The common theme among the panelists was how opaque and difficult the interconnection process, permitting, and property tax issues are for solar projects. Large companies, with the resources to deploy (person hours and money) can handle these complexities and road blocks. Small companies cannot. The new “Value of Distributed Energy Resources” (VDER) pricing for solar has a lot of positive attributes, such as trying to direct projects where they are needed most, but does not address the disparity between large and small projects. Yes, from a climate change and grid perspective, the more solar the better and that means big projects, which are cheaper bring a lot of benefits. However, if we are to truly avoid disastrous climate change, create jobs, and produce a more equitable society, we need to have small projects peppered around the state. Think about it. Small projects on the local church, community center, or civic building do more than produce clean energy. They create a stronger sense of community, build a broader constituency for a clean environment, and help contribute to hard-hit towns across the state. Consumers will keep their energy dollars local, help create local jobs, and support the growth of small homegrown solar companies across the state. Finally, incentivizing small projects is the right thing to do. Climate change impacts everyone, but it hurts economically depressed communities even more. Everyone deserves to reap the benefits of climate change solutions. To its credit, NY state leaders see this problem and are working to address it, but they need to do more and do it faster. They need to come up with a carve-out for small projects that would get greater incentives and help with regulatory red tape. This would make our state’s new community shared solar program a win-win for everybody, the way it’s supposed to be. To TAKE ACTION on promoting community-shared renewables in New York State, join our statewide alliance in calling on Governor Cuomo to appoint People’s Commissioners to the Public Service Commission who will protect New Yorkers and the Environment. Welcome to Sane Energy Project! We are a New York based organization working toward a sane energy future that includes shutting down fossil fuel infrastructure and building a just transition toward renewable energy. Please explore our website tabs above for more in-depth information about us, our work, resources and action steps – and scroll down for recent blog posts! By now, it's an old story: A pipeline company says they *just* want to build a simple gas pipeline. Then later they want to add a compressor station. Just one they say. Then there's a proposal for a power plant. And another compressor. Then a larger pipeline. This story has played out across Pennsylvania and New York State, with the result being broken dreams, devalued property values, assaults on human and animal health, and the destruction of eco-systems, wildlife preserves, and farming communities, turning them into industrial zones. The Eldred compressor is a new project that Millennium expected to roll over a rural upstate community, but that community organized in record time, and is saying, "Not so fast." SCRAM (Sullivan Country Residents Against Millennium) has quickly geared up for a big fight, hosting local forums and warning locals of the toxic effects of compressors. Millennium Pipeline Co. has purchased 80 acres from the Eldred Preserve (Town of Highland) in western Sullivan County, for a new proposed compressor station. This site was a hunting club that leased to drillers early on, but the town passed an ordinance that prevented drilling (and then the statewide ban happened). Now, the local ordinance – and local community resistance – will be tested by this interstate pipeline, and the usual FERC (Federal Energy Regulatory Commission) steamroller. This compressor is connected not just to the Millennium pipeline but to the CPV Valley power plant, the Valley Lateral pipeline (which would connect Millennium and CPV) and the Hancock compressor, where they plan to add a second compressor, plus additional work at Ramapo. Together, these changes are part of the Eastern System Upgrade, a new name for an illegally segmented project that began with the Minisink compressor. If Eldred is built, that would make four compressors within 60 miles, which far exceeds the industry standard, and is indicative of future plans (not yet public) to expand their system further. They could be planning to loop the line (add a second parallel pipeline in same right-of-way) or connect additional future pipelines, and almost certainly will want to add later compressor stations or power plants (as is typical of recent trends). Based on their stated in-service date of Fall 2018, they were clearly hoping to ram this through what they expected to be a sleepy rural area. However – true to the area's history as the incubator of the early anti-fracking movement – that has not been the case. • It may be rural and underpopulated in the region but there is an already activated anti-fracking community, plus a nascent farm-to-table community, with the popular Callicoon Farmer’s market, a growing weekender population, and chefs opening new restaurants. • Millennium can’t get building permits unless FERC overrules the local ordinance (which of course they will, but that is expected to bring a lawsuit). It will become a legal test of local ordinances that could shine the light of public attention on the project. • In order for the Valley Lateral pipeline to get going, Millennium needs to clear trees by the end of March (or hold until Fall). State Attorney General Eric Schneiderman has already issued a letter to FERC, objecting to the tree cutting. • Scandal surrounds the CPV project: the CEO is under indictment and they are already bogged down in lawsuits. Millennium and CPV are suing the state Department of Environmental Conservation, saying they are taking too much time with 401 Water Quality permit for the Valley Lateral pipe. • Without these compressors / compressor upgrades and the Valley Lateral pipeline, the massively polluting CPV power plant (currently under construction) would be starved for gas. This is a project with far-reaching impact; if it can be stopped, it could prevent a host of other future compressors, power plants, pipelines. What's going on with the Spectra Pipeline and the NY Offshore Wind Farm? It sorta seemed like the last few months of 2016 at Sane Energy Project were a whirlwind of fighting the bad stuff (Spectra's "AIM" Pipeline among the plethora of other interconnected battles) and pushing to bring on the good stuff (Offshore Wind Power to New York's electrical grid and Energy Democracy). So much action and energy happened, news changed almost daily that it was hard to give a comprehensive update. But here we are, just past December 21st, the day marked as the "beginning of light", the bright days will start getting longer, we are in a place to rest, rejuvenate, seek clarity and give a comprehensive update. First, The Spectra Pipeline, and scroll down for the NY Offshore Wind update and action steps! First, The Spectra Pipeline. What's the story? We have had many friends and allies call, email and text us "What is going on?! Has Spectra turned the gas on?" Here's the skinny: Not as of December 23rd 2016, almost two months behind schedule, but they are getting ready to ask the corrupt FERC to give them the green-light. However, there is more to it. If they do turn the gas on, say, next week, we have to remember this is only ONE small part of a GIANT pipeline EXPANSION project that they have illegally segmented into three false projects. Our work is just beginning to stop Spectra Energy's abuse of our democracy, health and safety. We started a petition to Governor Cuomo to prevent Spectra from getting the Water Quality Certificates for their 2nd segment. How do we know this is their plan, and why is it important to knowing what's going on presently? Plain and simple, they tell us directly while playing their day-to-day public relations as if they are separate projects. Clearly, we know they have zero respect for the public, but to also underestimate our intelligence to comprehend a two-headed monster in our communities? AIM, Atlantic Bridge and Access Northeast are three parts to one pipeline expansion that names exactly their goal: To get the gas out of the Maritimes in Canada. And that doesn’t bode well with other capitalists based in Canada looking to sell to the US market. Even the industry reports tell us that Spectra's plan to reverse the flow of their existing pipeline that they are expanding under the guise of this triple-threat that will export out of the USA is getting a furious reception from Respol, a large Spanish oil company with Canadian projects on the same pipeline route. We must not allow Spectra Energy to dupe the public into thinking this is three separate projects. This is all one pipeline disguised as three projects to avoid addressing Cumulative Impact studies and statements. See HERE a video from local resident, Nancy Vann, standing on a street in Yorktown, NY explaining how Spectra claims AIM and Atlantic Bridge are two separate projects. Why should we stay engaged? How can we win? The movement is growing, getting smarter, becoming trusted friends and are ready to take on the manifestation of a new regime in 2017. So we have to remember, when this entity wishes to build walls and separate us, we must work counter to it. We know they have 2 things: Money and Violence. and we have SO much more! We have a growing community, we have build sophisticated communication networks, alliances, support systems, we answer to each other when we call for HELP across the region… and we will refine and just get better with time to build the system we know is possible and serves all life on this small planet called Earth. Second What’s Up With The Wind Farms? First, We ROCKED the house at the last Long Island Power Authority public meeting on December 20th, where we stood with many members of labor and the environment to send a CLEAR and direct message to Governor Cuomo that WE WANT WIND! We will be back on January 25th 2017 to support and hopefully pop the champagne when LIPA approves this Eastern Long Island project. We need renewables, and we need them NOW! JOIN US! Details to come. Make sure Governor Cuomo makes a FIRM commitment to developing 5000MW of Offshore Wind Power for the State of New York making sure we are a vibrant, local industry hub for the lead int he renewable economy! We don't want just megawatts in the water! NO! We want to do this right! And that is where our activism comes in. Sane Energy Project knows we have vibrant and growing support from labor and wildlife advocates, and our work is to make sure this renewable generation leads a transition of JUSTICE and benefits rate-payers, particularly low-income rate-payers who typically are burdened with high energy bills and dirty generation planted in their biospheres. We know that Statoil won the lease last week to develop wind power in the Rockaway location. We originally were suspecting that a NYSERDA/DeepwaterWind partnership was going to secure the lease, but the bidding process went on for nearly TWO days, with Statoil securing the are for $45million. Sigh, capitalism. So, this doesn't change our work, except we knew that we knew the players with NYSERDA and Deepwater. Deepwater just completed the USA's first Offshore Wind Pilot Project in Rhode Island using local, union labor and completely stopped construction during whale migration. They honor the community values we ask for. So we just have to build the base (just like we did to stop fracking in NY, stop Port Ambrose, Stop Constitution, Stop Shell's Water Withdrawal in Painted Post... pssst, we have got the POWER!) and make sure Statoil comes to our table and honors our community values. See you at the next Sane Energy Project All Star Meeting, January 10th at 72 Greene St. @ Patagonia SoHo 2nd Floor Environmental Co-Working Space! And let's get to work! Dear Senator Schumer: It's now or never. Meet 1,000 of your favorite movement-makers at Sen Schemers NYC office to Stop Spectra AIM Pipeline. With the NED and Constitution pipes no longer absorbing the energy of advocates, Spectra's AIM pipeline now becomes the big focus, and the need for action is URGENT: construction is already underway for this high-pressure, large-diameter pipe sited within 105 feet of critical Indian Point facilities. Like those other pipes, this one crosses multiple states and uses the same tired excuses of supplying fuel to New England, despite the fact that New England doesn't need or want the pipe. Now is the time to stop this pipeline for good. Click HERE for more info! Constitution and NED Pipelines Halted! Mr. Gerhart wrote the following letter to Pennsylvania governor, Tom Wolf, the day before tree-cutting crews came onto his property, against his will, to make a path for the Sunoco Mariner East 2 pipeline. His wife, Ellen, was put in handcuffs the next day when she attempted to alert crews that they were endangering their daughter Elise, who was 40 feet in the air, in a tree sit in the path of the pipeline. The letter was posted to Facebook here. The legal fund is here. The story of what happened the day after this letter was written is here. I am 85 years old, living in PA since 1957. I came to the USA after the Soviet Union crushed our Revolution in Hungary in the fall of 1956. I was fighting on the streets of Budapest after they came in with fresh Asian divisions. After two months of resisting I had to escape when the Soviets re-established the Hungarian Communist government. They began to arrest people who were known to be opposing them. Many people were taken to Siberia and never seen again. As a child, I grew up under the Nazi system. My small country lies in the center of Europe. Germans made us into their satellite. In the summer of 1944, I witnessed the collection and deportation of Jews, and I watched as they stuffed them into cattle cars in a nearby station. I believe I even saw the infamous Eichmann on the streets of Budapest. My father died in 1945, in the defense of Budapest. Twenty-five thousand other Hungarians also died in the war. The Soviet Union “liberated” us from the Nazis. When Russians began to fight for Budapest, they raped my mother in front of me. I was 13 years old at the time. The Soviets installed the Hungarian Communists as the government. In 1948, I was an apprentice in a one-man engraving and jewelry shop. My boss worked very hard to establish his small business. One day two Hungarian secret police, dressed like the Gestapo from years before, came in their long leather coats to the shop. They said to my boss, “This shop is now nationalized; you have to leave.” In a few minutes, my boss was gone. The “police” told me to take an inventory of the tools in the shop and they told me I would have a job in the nationalized jewelry and engraving system. By that time all major businesses, banks, and mines, were taken over by the communists. This is the way it was. As a result , I have seen the arbitrary decisions made by both the Nazis and the Communists. In 1956 we Hungarians rebelled against the Soviet Union and the Hungarian Communists. I wanted you to know all this, because now, the Sunoco Logistics company, wants to take over part of our land. We have a pond, streams, and wetlands, “in the way” of the proposed pipeline. Ducks, geese, herons, kingfishers, turtles, frogs, and fish have all found homes there. Our century old trees are homes for countless birds and mammals, including the endangered Indiana brown bat. Our forest is teeming with other wildlife, deer, bear, foxes, snakes, turkeys, grouse, that make their homes there. We have tried to live up to our promise made when we signed on to the Forest Stewardship (Clean and Green) program when we purchased our property in 1982. We are living, breathing Pennsylvanians who have tried to preserve this land. Sunoco is a billions of dollar, faceless entity, based in Texas. The products that they want to transport through our land are not needed in Pennsylvania, or anywhere else in the United States. The rich executives of Sunoco have decided that they can make a lot more profit by selling the Natural Gas Liquids overseas. It is unjust to give them the right of eminent domain so that they can trample on the rights of the people of Pennsylvania. My wife of 40 years and my youngest daughter are distraught over your decision, as am I. Please reconsider your decision and side with the people of Huntingdon County who elected you and pay your salary. UPDATE: Just days before the end of the month, tree-cutting crews, accompanied by the local Sheriff, moved in on the Gerhart property in Huntingdon County, Pennsylvania. Sunoco Logistics had taken the property by eminent domain for the Mariner East 2 pipeline, which will carry natural gas liquids (i.e., propane, butane, ethane) from the frack fields in Ohio, West Virginia and western Pennsylvania to the Philadelphia area. The Gerharts are stewards in a forestry program, and had committed never to develop their property, and to keep it as a forever-wild preserve. The family had not agreed to the eminent domain settlement and Sunoco proceeded with the tree clearing despite lacking necessary water-crossing and erosion permits, and while its claims to eminent domain are under challenge in Pennsylvania courts. On March 29th, 29-year-old Elise Gerhart created a tree sit in the path of the pipeline, and vowed to stay there until the tree-cutting season ended on March 31st. While a local news crew was mid-interview with Ellen Gerhart, Elise's mother, trees were cut dangerously close to the one Elise was in, and then dropped onto supporting guy wires. Ellen ran towards crews to warn them and was removed in handcuffs (video here). Two other advocates, who did not cross into the work area, were arrested and jailed for two days, and originally burdened with $100,000 bail (later dropped). One of the most moving parts of this story is a letter, written by Stephen Gerhart to the Pennsylvania Governor, which was posted to Facebook. Mr. Gerhart, a survivor of both the Nazi and Soviet regimes in Hungary, is no stranger to unjust systems. His letter is reprinted here. Energy Justice Network is fiscally sponsoring a fund for supplies, legal expenses, and costs associated with challenging and monitoring Sunoco’s project. Pancakes not Pipelines: FERC commissioners declined a pancake breakfast (using syrup from the Holleran Farm, whose maple trees were cut for the Constitution pipeline) served up by Tim DeChristopher, working a solar-powered cooktop in front of FERC offices. The action included Megan Holleran, Josh Fox, Bethany Yarrow, Karena Gore, Gabriel Shapiro, Don Wightman, Ron Coler and Jane Kendall, arrested at the ResistAIM blockade just 2 days earlier. Photo at left by EcoWatch. EcoWatch quoted DeChristopher as saying that FERC had “cut down life-giving maple trees to make room for a death-dealing pipeline.” The agency has been “able to get away with this shameful behavior by operating in the shadows,” he continued. “We’re here today to invite FERC employees into the open, to engage in a human way with the people whose lives are impacted by FERC’s decisions.” But commissioners turned down the yummy breakfast and chance to chat. Beyond Extreme Energy will continue actions at FERC during the Rubber Stamp Rebellion from May 15 to May 22. The week of action will take place right after the May 4 – 16 #BreakFree days of action that 350.org is organizing. BOEM is also the agency that approves offshore wind farms. Bangladesh Coal March: Earlier in the month, thousands took part in a massive 4-day march in subtropical heat to protest the construction of coal-fired power plants dangerously close to the Sundarbans, one of the world’s largest mangrove forests and a UNESCO World Heritage site. The Understory reports: The Bangladeshi and Indian governments—whose joint venture company is building the Rampal coal plant—are teaming up with industry to abuse the human rights of the people who live near, and depend on, the Sundarbans, in order to build infrastructure that locks in climate change and would devastate a precious ecosystem. The campaign leading up to the defeat ran hot and heavy from Labor Day on, rallying massive turnouts–from hearings on Long Island to street performances in front of a Broadway show where Governor Cuomo held a fundraiser. Sane Energy Project has supported the efforts of local organizers to lead a campaign of Creative Peaceful Resistance (CPR) against the construction of the Algonquin Incremental Market (AIM) pipeline, since its approval by FERC over the objections of the public, and the start of tree cutting. These efforts have involved hosting frontline residents at forums throughout Westchester and NYC; promoting their pledge to resist, facilitating art builds, media outreach, and organizing support teams for blockades. Co-Director, Kim Fraczek, was arrested with local advocates at the first blockade on November 9th. Because of Sane's alliances, there were even corresponding blockades using inflatables on the same day in Westchester and at the Paris COP 21 talks! The statewide REV (Reforming the Energy Vision) has been a big focus for us this Fall: "Make REV R.E.A.L (Renewable, Equitable, Accountable and Local)" started with a banner for a joint Sierra Club/Sane rally, then became the clarion call for the Energy Democracy Alliance, of which Sane is a member (logo, below, courtesy of Sane's artistic powerhouse, Kim Fraczek). There was a packed house at the REV hearing at NYU on October 27th, calling on the Public Service Commission to stop supporting fracked gas and coal infrastructure and replace these polluters with offshore wind and solar. And there were so many other events! We led off our new bi-weekly Sane Energy volunteer meetings with trainings for the Port Ambrose and REV hearings; we supported the Blued Trees art project; we presented the YOU ARE HERE map at Seneca Lake, we screened THIS CHANGES EVERYTHING and connected the global climate crisis to local fights with environmental justice speakers; and our Climate Rider, Lorna rode nearly 400 miles to stop climate change, and we threw her a big fun party! (There was so much more that we can't fit in here, and that's why we encourage you to keep up with us daily on Facebook, where all the late-breaking news and events across the state are posted!) We so look forward to doing more great advocacy with you in 2016! If you would like to support the work we do, please click here! The holidays are considered a great time for slipping in major infrastructure projects (it's a tradition for FERC to drop 1000-page Environmental Impact Statements, or for projects to get signed off while they think no one is looking). But we're on our toes and we're keeping the pressure up on the DEC and Governor Cuomo to deny the 401 Water Quality Certificate that is the last piece of paper the builders of the Constitution Pipeline desire. If they don't get it soon the window will close on their opportunity to start clear-cutting forests (restrictions on the timing exist due to migratory bird laws). Call, write and email the governor and the new DEC Commissioner RIGHT NOW! These next two days before New Years are crucial. Here's how to do that: CLICK HERE. Because lives and livelihoods hang in the balance. A large swatch of land and the communities in the path of this pipe will be subject to multiple harms: the pollution from compressor stations; the risks from mud slides and flooding after forests are clear cut; the destruction of clear, cold streams that are trout habitats and a foundation of the local economy, just to name a few. Perhaps the best illustrations of the issues are these personal stories, of families whose property has been taken by eminent domain for the private profit of this company. This is Diana and Phil Hulbert and their granddaughters Rebecca, Michaela and Dakota by their home in East Meredith, New York. Diana and Phil have lived here in the northwest Catskills since 1972. This year, the Constitution Pipeline Company used eminent domain to obtain permanent easements across their property. This is Jeff Strassenburg and his golden retriever, Ixtapa (aka Pumpkin), in Sidney, NY. They're standing next to the solar panels that power their house and car. If built, the large-diameter "Constitution" and NED pipelines will run a few thousand feet from their home, transporting fracked gas under high pressure from Pennsylvania to Canada for export. This is Bruce Baxter, one of many enterprising landowners along the route of the proposed “Constitution” pipeline. He has made a living growing Christmas trees on his property in Bainbridge, NY, for more than 30 years. He also has plans to raise trout year-round using a solar-heated aquaponics system—an endeavor that would create several permanent local jobs. The pipeline company claims it would bring seven jobs to central New York. In fact, it would take more jobs than it brings. Their pipeline would ruin Bruce’s tree-farm business and render his new trout business impossible. The pipeline company has been granted the power of eminent domain to take Bruce's land for this fracked-gas export line. This is Dan and LJ Brignoli standing on the route of the proposed “Constitution” pipeline, next to their home in Davenport, New York. If built, the pipeline would clear-cut more than 700,000 trees, including hundreds just uphill from Dan and LJ’s house. Here in the flood-prone northern Catskills, the couple has seen their road destroyed three times by raging floodwaters in the past decade. Without tree roots to hold the soil in place, the next big flood would be catastrophic. In exchange for situations such as the Brignolis’, you’d think New York might be getting a lot of cheap gas. However, the majority of the fracked gas in this 30-inch-diameter line would travel from Pennsylvania to Canada and beyond. Even more unbelievable: The pipeline company has been awarded the right of eminent domain to take the Dan and LJ’s land for this export project. This is Alicia Pagano with her daughter, Janice, on their property in Sidney, NY. The 30-inch-diameter “Constitution” gas pipeline is slated to cross the creek behind them about a quarter mile downstream. Alicia was born and raised in these foothills of the western Catskills. In her 86 years, she has lived through several “100-year” floods, including three in the past decade alone. "Water is a powerful thing," she says. "With every flood, Carrs Creek transforms from a quiet stream to a raging torrent. It pushes heavy rocks, huge trees and anything else in its way as it careens toward the Susquehanna River. It's even taken large swaths of our land. In a competition with the creeks up here, pipelines will always lose." This is Chris and Tim Camann with their dogs, Amelia (left) and Munchkin, at home in Sidney, New York. Nearly four years ago, the Constitution Pipeline Company informed the couple they would be installing a 2½-foot-diameter high-pressure pipeline next to their home and through their field and forestland. The company claimed it would bring cheap gas to New York and the northeast. In fact, this proposed pipeline is slated to take fracked gas from Pennsylvania through New York State to Canada for export, which will lead to higher prices here. The company behind this scheme acquired the necessary portion of the Camanns’ land using eminent domain. Chris and Tim will still be required to pay taxes on land they can no longer use while the pipeline company profits from it for years to come. Despite the unjust use of eminent domain and the danger of the massive pipeline, what devastates Chris and Tim most is how it will damage the woods and creek behind their home where they walk with their dogs every day. The couple has cared for their mature hillside forest for more than 25 years. Heavy machinery will clear-cut through these woods, leaving a treeless corridor at least 110-feet wide. Crews will bulldoze and excavate through the creek and its tributaries and blast through the rocky terrain of the Catskill foothills, forever degrading the forest-and-stream ecosystem. Our friends at People, Not Pipelines are running a campaign right now that we URGE you to support. Please get your call, email or letter to Cuomo before New Year, as we are concerned the DEC may try to slip an approval of the last permit through over the holiday while they think no one is watching! EVERY DAY COUNTS! THIS TAKES LESS THAN 5 MINUTES! If approved, the Constitution Pipeline will usher in more fracked-gas infrastructure to keep us addicted to fossil fuels for decades. And it will open the door to the Northeast Energy Direct (NED) project, another pipeline proposed along Constitution’s hundred-mile corridor through New York. Recently we learned that NED plans to serve a massive new gas-fired power plant along this route, pumping five million tons of additional greenhouse gas emissions into the air every year. Those climate impacts double when you count methane leakage. And though the plant’s location is still secret, unsuspecting sacrifice communities will be exposed to toxins like benzene, nitrogen oxide, and formaldehyde. Perhaps most insidious, NED's compressor stations and power plant could be added to Constitution, even if NED isn’t built. We need a swift transition to renewable energy, and we need it now! CALL CUOMO:877-235-6537 Urge him to deny the Constitution Pipeline water quality certificate and protect New York from more fracked-gas infrastructure, now and in the future. It will be impossible for New York to meet its renewable energy and greenhouse gas reduction goals if the state permits more projects that burn fossil fuels, like a massive gas-fired power plant along the Constitution/NED corridor. A state that banned fracking should not promote fracked gas. The new power plant proposed along the route of the Constitution/NED would burn over 200 million cubic feet of fracked gas per day and spew 5 MILLION TONS of additional greenhouse gas emissions and toxic chemicals into the air every year. Approving more gas infrastructure takes us backwards. It's time to kick the fossil fuel habit and aggressively pursue renewable energy from wind, water, and the sun. Even if NED goes away, all of the dirty compressor stations, power plants, and other gas infrastructure proposed by NED could still be added to Constitution. There is only one solution, and that is for Governor Cuomo to Stop the Constitution Pipeline. Your administration recently announced a bold goal of dramatically cutting greenhouse gas emissions and meeting 50% of our state’s electricity needs with renewables in just 15 years. That won’t happen if New York becomes more dependent on fracked gas. Approving the Constitution Pipeline would encourage more gas infrastructure—compressor stations, power plants, distribution lines, and storage facilities—holding us hostage to fossil fuels for decades to come. And it would pave the way for yet another pipeline, the Northeast Energy Direct (NED) project, following Constitution’s proposed 100-mile route through upstate New York. Most recently, the public learned of plans by NED to supply more than 200 million cubic feet of fracked gas per day to a massive new power plant somewhere along the Constitution/NED corridor. If built, the facility would spew four to five million tons of carbon dioxide into the air annually, along with toxic chemicals like benzene, nitrogen oxide, and formaldehyde that can cause respiratory and neurological problems, cardiovascular disease and cancer. And since the plant’s location is still secret, New Yorkers are left to wonder which community will be its victim. With respect to global warming, we are all victims of gas proliferation. Taking methane emissions into account, natural gas is equal to or worse than coal as a driver of climate change. So touting aggressive climate goals while supporting gas is simply dishonest. Finally, the public is painfully aware from projects like Minisink and its spin-off power plant in Orange County that if you approve the Constitution Pipeline, more will follow. Even if NED disappears as a separate project, all of the dirty compressor stations, power plants, and other gas infrastructure associated with NED could still be added to Constitution. Governor Cuomo, that puts us at a crossroad. A state that banned fracking should not promote fracked gas. Deny Constitution’s water quality certificate. Let’s kick the fossil fuel habit once and for all, switch to renewables, and build a future of which we can be proud. As corporations are leveraging the legal tool of eminent domain to condemn private properties along pipeline routes, as was just recently done to homes along the AIM pipeline in Westchester, the artwork Blued Trees is contesting the justice of that leverage, using the sword of copyright law. Blued Trees, created by eco-artist Aviva Rahmani, consists of trees in the line of destruction on which a blue sine wave is painted. One such tree is one note in the score. One-third mile of these notes constitutes one full measure in the symphony. A Cease-and-Desist Demand has been served on the Algonquin Gas Transmission LLC. That corporation seeks to condemn the private property in Peekskill, NY, on which the overture for the project was installed on June 21, and copyrighted. The overture was created on land that has been owned by a small group of families for four generations. That property lies in the path of the Algonquin Incremental Markets pipeline. The pipeline is slated to pass just 105 feet from vital structures at the Indian Point nuclear facility, 30 miles from New York City. Additional measures and “Greek choruses” have joined the Blued Trees orchestra from 11 other sites internationally since the summer solstice overture launch. This past weekend, a new chorus was added in Oneida County, NY. See photos of that installation here. The words of Pope Francis, delivered at the United Nations General Assembly on Sept. 25, resonate with Rahmani and other Blued Trees participants: “Any harm done to the environment . . . is harm done to humanity.